Homemade gift baskets are a great way to incorporate your creativity and talents into a special holiday gift for friends, family, coworkers, and neighbors. Making parts of the gift yourself adds a personal touch that any recipient will appreciate, and there are lots of wonderful creative ideas out there to try. Use these fun ideas to create a personalized gift for everyone on your list, regardless of age. Choose a large basket with a handle. The basket should be big enough to hold a cookie sheet. Make up a batch of easy sugar cookies, but don't bake the cookies. Instead, roll them into a log and wrap them in plastic wrap. Then wrap the dough in a festive holiday towel and place in the refrigerator until you're ready to give the gift. Purchase a rolling pin, cookie cutters, decorative holiday sugars, and a cookie sheet. Arrange these items in the basket. Write down the baking instructions for the cookies on a holiday card. Tie the card to the cookie dough with a ribbon. When you're ready to give the basket, place the cookie dough with the other items. Purchase a medium-sized plastic bin or bucket to work as the gift basket. Kids can store their supplies in this container after the holidays. 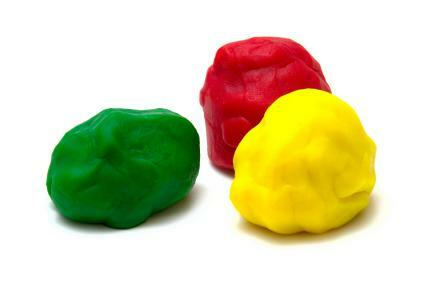 Mix up a batch of salt dough and dye it red and green. Package it in resealable containers. Purchase holiday-themed cookie cutters to tie to the salt dough containers. Download and print some printable Christmas crafts. Make them into a book. Purchase markers, paints, paper, brushes, and other art supplies to add to the bin. Arrange everything in the bin to create a fun gift basket. Purchase a medium-sized basket to hold all the gifts. Using blank index cards and a holiday rubber stamp, create personalized recipe cards. Tie them with a ribbon and place them in a recipe box. Make an apron with a holiday theme. You can buy Christmas fabric at the craft store or simply decorate a red apron with green trim. Purchase holiday kitchen towels and pot holders, as well as a few wooden cooking utensils. Arrange everything in the basket and give it to the lucky recipient. Start with a long bread basket that can be used to serve rolls or bread for the meal. Inside, place homemade Christmas table decorations, like placemats and napkin rings. Purchase a few more odds and ends, such as matching napkins, Christmas-themed salt and pepper shakers, and candles. Place everything in the bread basket and give to the recipient. Purchase a medium-sized basket to hold everything. Purchase and decorate clay pots. You'll want about three that are fairly small in size. Choose holiday colors for your decorations. Pick up some gardening tools, such as a small spade and rake. Also purchase a small watering can and some red or green gardening gloves. Fill a small bag with enough potting soil to fill all the small pots. Tie the bag with a Christmas ribbon. Purchase seeds for several different herbs. Arrange everything in the gift basket. Buy a large basket to hold everything. Make a no-sew fleece blanket to be the centerpiece of your gift. You can choose holiday colors or a color that matches the living room decor. Buy a great family read-aloud book. Fairy tales and classic favorites are always great options. Purchase Christmas mugs for everyone in the family. Buy some high quality chocolate chips and attach the recipe for homemade hot chocolate to the bag. Arrange everything in the basket. Purchase a steel bucket to use as a basket. Make a batch of steak rub and package it in an attractive glass jar. Make your own basic barbeque sauce and keep it refrigerated until you're ready to give the gift. Be sure to package it in a nice bottle. 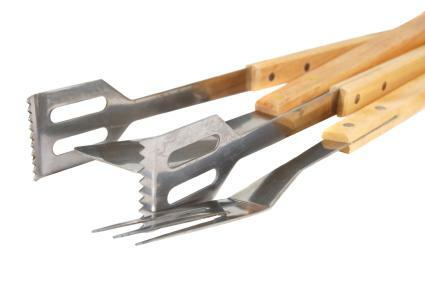 Purchase grilling tools, an apron, and an oven mitt. Arrange everything in the bucket and give it to the lucky guy. Buy a large plastic bucket in red or green. Purchase one yard of terrycloth fabric in red or green, as well three packages of double-folded seam binding. Wash the fabric several times to soften it. Cut the fabric into four large rectangles and sew the seam binding around the edges. Fold the cloths neatly and place them in the basket. Purchase car wax, soap, and sponges. Arrange these items in the bucket. Purchase a small basket to hold all the goodies. Make your own sugar scrub. All you need to do is a cup of white sugar, half a cup of coconut oil, and one teaspoon of vanilla extract. Mix everything together and place in an attractive jar tied with a Christmas ribbon. Purchase manicure tools, emery boards, nail polish remover, and several bottles of nail polish in fun holiday shades. Place everything in the basket and tie with a holiday ribbon. Don't forget to make a basket for your furry friends. These dog gift baskets are perfect for friends and family who own pets. The centerpiece is homemade dog biscuits. Buy a small canvas tote to hold the gifts. Mix together one cup of flour, two tablespoons peanut butter, half a tablespoon vegetable oil, half a teaspoon salt, and a third of a cup of chicken broth. Roll out on a floured surface and cut into Christmas cookie shapes. Bake at 400 degrees for 20 minutes and allow to cool completely before packaging. 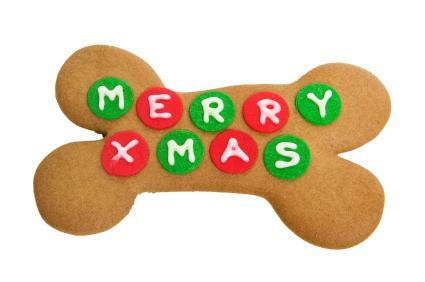 Purchase a nice dog blanket, a new leash and collar, and a fun dog toy. Place everything in the tote and tie with a Christmas ribbon. 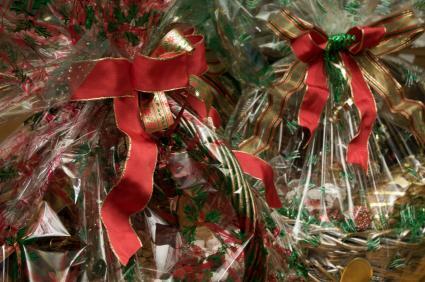 Buy a sheet of red or green cellophane and place the basket in the middle. Draw the cellophane up around the basket and tie with a Christmas ribbon. Purchase a yard of Christmas-themed tulle fabric. Wrap the basket in the tulle and tie the ends. Use Christmas tissue paper as filler in your basket to make everything stand up the way you want. Decorate the handle of your basket with Christmas ribbon. Add bells or pinecones for a more festive look. No matter who is on your list, there's a homemade Christmas gift basket that's a perfect fit. Get creative and add your own items to the basket. You'll be making a practical and personalized Christmas gift that will really please.